Cultural Differences - New Build! GameMaker games and Windows 10 seem to be butting heads on certain systems. If your display goes black and then white (showing nothing and no response from Savage) when starting the game in Fullscreen, here's what seems to fix the issue. RIGHT CLICK on the Savage .exe and open Properties and navigate to the Compatibility tab. 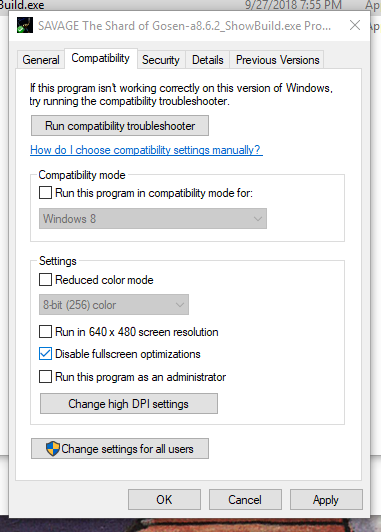 CHECK the box under Settings labeled "Disable fullscreen optimizations". Click APPLY. Doing this seems to have worked for the user that reported it (THANK YOU Gallus!). Going forward, every Friday at 1pm Central, I will be doing a weekly wrap up show on my Twitch channel called "Let's Finish Savage" that will coincide with a weekly game update (big or small, whatever gets done and is ready for deployment that week). I'll go over new content added, bugs fixed, tweaks and polish, and ANYTHING and EVERYTHING you can expect in these weekly builds. The plan is to also cover any future plans and roadmaps (i.e. what you can expect in following updates and builds), followed up by some Q and A, provided anyone watching has any questions! OK! With those out of the way, let's dig into this shiny (and broken) new build. A big batch of new NPCs and characters have been added into the game, each with their own personalities, tasks and animations. Some of them vendor new items! Some will be a trigger for new events and story elements. In addition, new rooms and buildings have been added to Gussek, the border village you first see when exiting the Mining Prison. One of the biggest features I've added to the game is the ability to actively attack ANY NPC in the game. Doing so will make them permanently hostile to you and they will then behave like an enemy object to you until slain. Doing this has consequences, of course. Now that you've met them, kill them. You used to be able to totally spam healing items, regardless of your player state. NO LONGER. You will now have to find a safe moment or location to STOP and eat meat, drink potions etc. The world is a dangerous place, and it's gotten worse. A whole slew of new and terrible things can happen to you in the form of Status Ailments. These include Burning, Paralysis, Poison and becoming Cursed. But worry not! With every new deadly affliction comes a remedy. In addition to the new status ailments, you can no longer swim completely submerged indefinitely. You run the risk of drowning if you stay in the depths for too long. In addition to using an item like the Balm to mitigate Burning, jumping in the water (as well as being out in the rain or snow) can put the fire out. The number of times you've died and dropped Essence can cause said Essence to go wild, eventually transforming into a shadowy Twisted Self - an entity without any direction other than your demise. 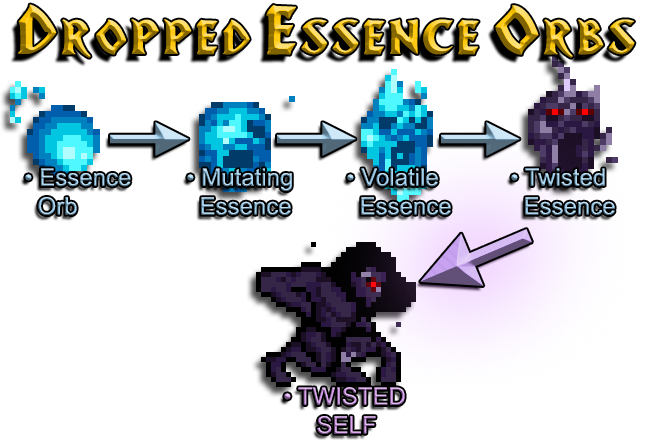 Dying and dropping Essence within a randomly generated encounter on the Overworld Map will LOCK IN the encounter, allowing you to run through it again and attempt to regain your dropped Essence. If slain by the Twisted Self, the plan going forward is to have him persue you in various locations and on the world map until one of you lies dead. A brand new third Major Stat called Cunning has been added to character advancement! In addition, the level up and character sheet has had a major overhaul (visually and mechanically), allowing you to see all of the sub stats that are affected by leveling up your Major Stats. In addition to some of these more dense features, there are a whole bunch of other changes, improvements and bug fixes to list. And probably other stuff I missed. Anyway, that's a wrap! I'll see you all again next week! The dumping ground for Matt Fitzgerald's comics, games, videos and other nonsense projects.